The first question might be "what is that?". 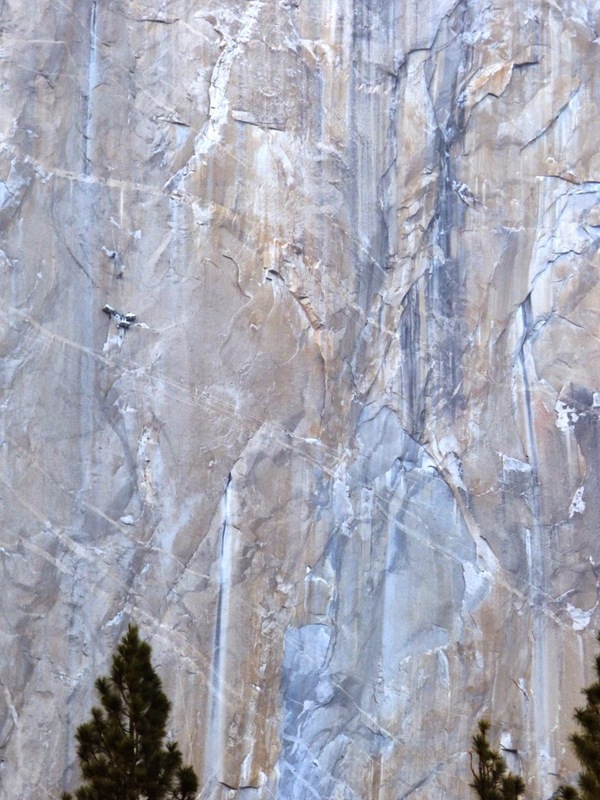 It's a pair of climbers, Kevin Jorgeson and Tommy Caldwell, on El Capitan (To-tau-kon-nu'-la) in Yosemite Valley (Ah-wah-nee) who are seeking to do something never before done...a free climb of the one of the most difficult rock faces in the world. Free climbing means they do the climb with their hands and legs only, not using artificial supports. It's not entirely insane, as they wear rope harnesses to protect them from falls, which they do a lot. In any case, their effort has made it into the national media. They haven't reached the top yet, but you can follow their saga here. 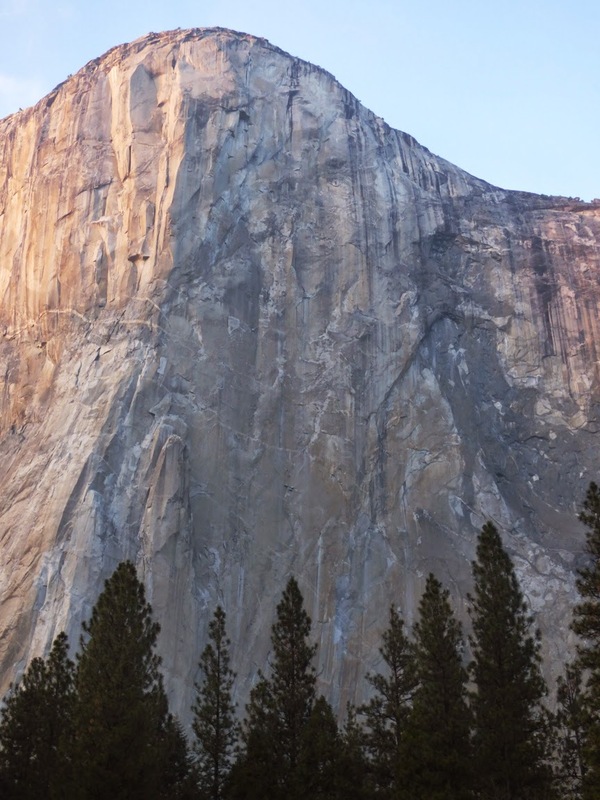 The climb up El Capitan involves about 3,000 vertical feet (914 meters). I was in Yosemite yesterday, and we reached the meadow below El Cap about sunset. Most of the spectators had already wandered off, and we wondered if we could see the climbers. It didn't take too long to find them, but needless to say, they were dwarfed by the cliff. I'm doing these pictures backwards if I'm trying to show how small they are against the cliff, but with a purpose. 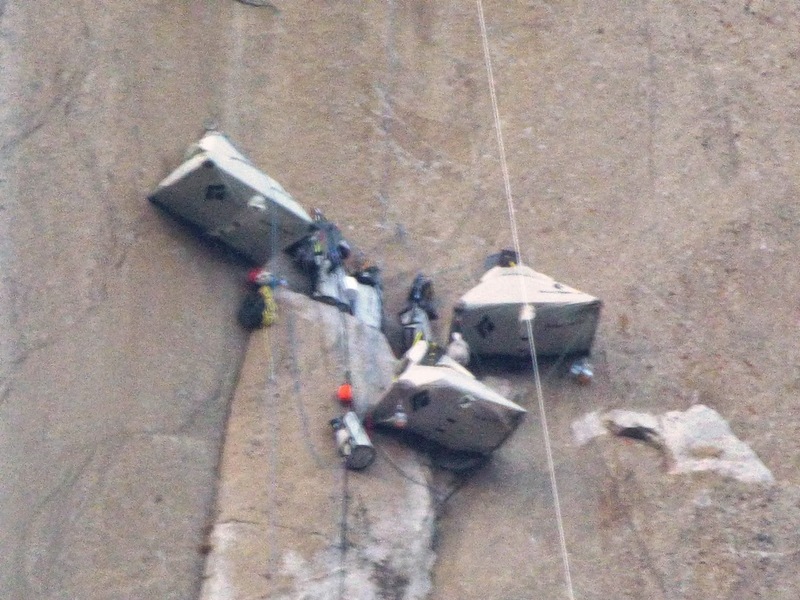 I realized the climbers had a slightly different story to tell, but probably not one they were intending. In the original story told by the first people about the cliff, two bear cubs were stuck on top of the cliff and none of the animals were able to rescue them until an inchworm volunteered to climb the vertical face. It was ultimately successful, although the effort took weeks. Geologists tell stories of the origin of the Sierra Nevada as well. Their stories are based on a different way of understanding things, and their stories are informed by data and observations, both from the Sierra Nevada, and around the world. 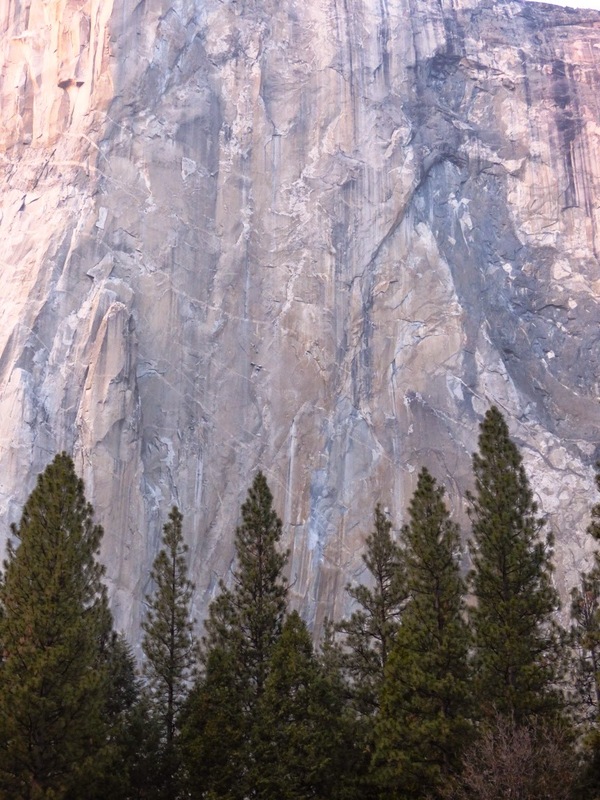 It occurred to me that the sheer cliff of El Capitan is a metaphor that we can use to understand the immensity of geologic time. 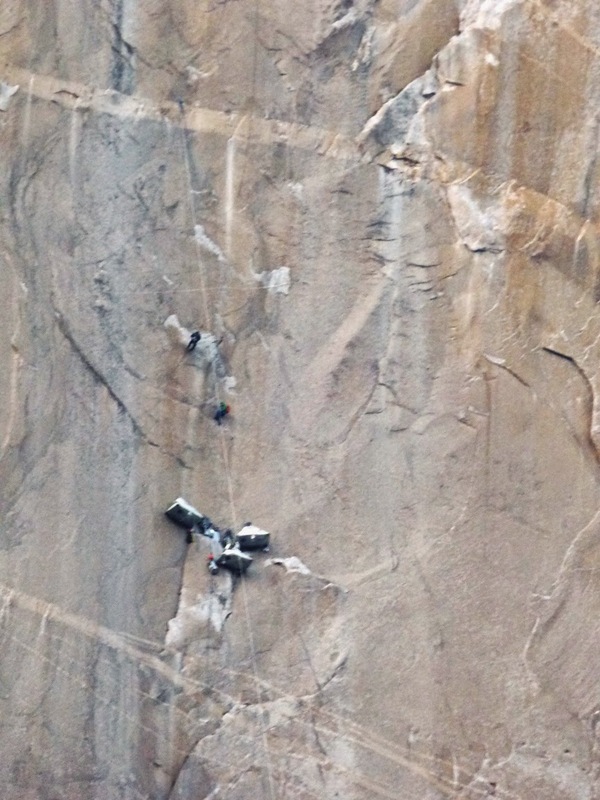 There is nothing quite like seeing the climbers sink into insignificance against the vast expanse of vertical granite. If we imagine each foot of the rock face to represent one million years, the entire cliff face represents 3 billion years. That represents about two-thirds of the entire existence of planet Earth. So we start climbing the face as the inchworm did. There was a lot going on around the world at that time. The first kinds of life had come into existence (primitive microbes), and the first continents were starting to form from the coalescence of numerous volcanic islands. The concentration of oxygen in the atmosphere was starting to rise, albeit very slowly. But there was no vestige of the Sierra Nevada. No rocks of that age exist in California, and for that matter in pretty much the entire American West. So we start climbing the cliff, each foot representing the passage of a million years. The oldest rocks in California, found in Death Valley and the Transverse Ranges, are 1.7 billion years old. 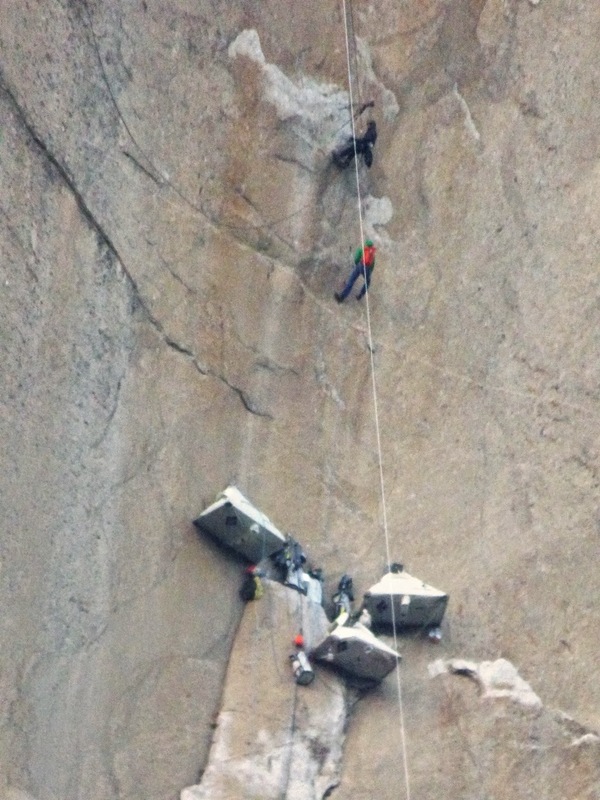 We would find them 1,300 feet up the cliff, perhaps very close to where the climber's base camp dangles. The oldest rocks of the Sierra Nevada found in any abundance are around 500-600 million years old, meaning we would find them at the 2,400-2,500 feet above the valley floor. Keep in mind, every foot is one million years. The oldest Sierra rocks were formed in an oceanic setting, and were pushed into the edge of the North American continent at different times between 400 and 200 million years. We've reached 2,600-2,800 feet up the cliff as we climb towards the present day. And we haven't even talked about the most common rock in the Sierra Nevada, the granitic intrusions. They happened when oceanic crust was being subducted underneath the continent. As the downward slipping slab of crust warmed up, water was liberated, changing the melting point of rocks at the base of the continental crust. The plumes of molten rock rose from the depths to within several miles of the Earth's surface. There it cooled slowly, forming the crystalline granitic rock. These events took place in episodes extending from 145 to 85 million years ago. In other words, we are now a mere 85 feet from the summit of the 3,000 foot cliff. From 85 million to maybe 45 million years ago, miles of rock were eroded, exposing the granite at the surface. The mountain range we now call the Sierra Nevada did not yet exist in a way we would recognize. Instead, large rivers with a source in Nevada or farther out flowed westward into a sea where the Great Valley exists today. There may have been highlands, a debate continues. What we do know is that the mountains were most certainly close to their present day elevation by 2 million years ago. That is, two feet from the top of the cliff. At this time, the climate of the planet cooled, and a series of ice ages commenced. Time after time the ice advanced, melted back, advanced, and melt back yet again. This happened a dozen times or more. About 750,000 years ago a titanic explosion rocked the Mammoth Lakes area. The eruption of the Long Valley Caldera put 150 cubic miles of ash into the atmosphere, covering the American West as far east as Kansas and Nebraska. A vast hole, twenty miles across, ten miles wide, and two miles deep, was left behind. This happened one inch from the summit on our imaginary journey. The last advance of the ice ages receded around 12,000 years ago (about a tenth of an inch from the summit). It was about this time that we have the first well-documented arrival of humans in North America. A tenth of an inch. Everything else, cultural development, wars and invasions, growth of mega-cities, all of it, happened in the infinitesimally small amount of space of the last hundredth of an inch from the summit. I can't really say that this is the handiest or clearest way of illustrating the immensity of geologic time, but it's what occurred to me as I stared at the climbers inching their way up the cliff, much as the inchworm did many years earlier as it sought to save the bear cubs in the depths of time. The Earth has been here for a long time, and we have not. It's amazing how many changes we have caused in our brief time on this planet.